This volume is about the life and work of the Swedish officer Philipp Johan von Strahlenberg (1676 –1747), who was a prisoner of war in Russia for thirteen years during the Nordic War. Captured some time after the Battle of Poltava in 1709, Strahlenberg was sent to Tobolsk in Siberia, where he was allowed to carry out geographical and historical research. 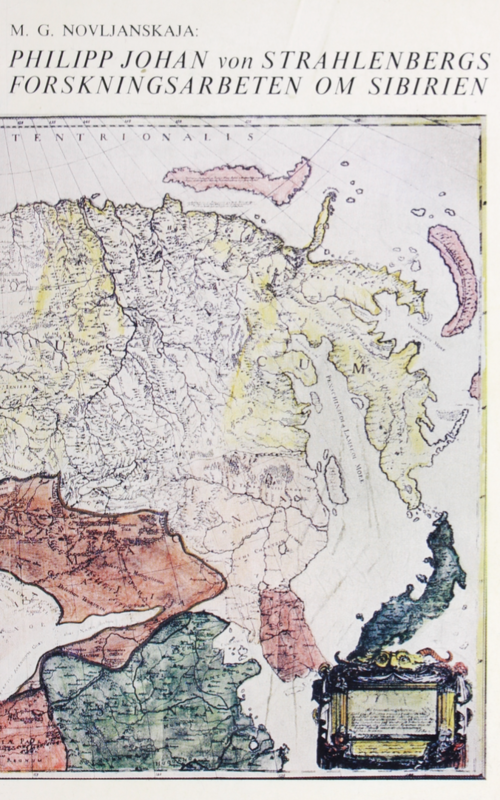 When Strahlenberg finally returned to Sweden, he published a map and a book about Siberia, both of which were well received and became important source material in Western Europe. The book was originally written in Russian by Marija Grigorevna Novljanskaja and published in 1966. The present volume, Philipp Johan von Strahlenbergs forskningsarbeten om Sibirien, is a Swedish translation from 1968. Based on a compilation of archived materials and literature from different sources, the author gives an exhaustive account of Strahlenberg’s life and work showing the importance of his role for western knowledge of Russia and Siberia. During the Nordic War between Sweden and Russia, 1700–1721, a large number of Swedish prisoners of war were left in Russia. After losing the Battle of Poltova in 1709 the Swedish King, Charles XII, fled to Turkey. The Russians had captured ca 16.000 men. A large portion of the prisoners were sent to Siberia. Those of lower rank were employed as construction workers, while officers were sent to live in the bigger cities. Many Swedish and German officers where sent to Tobolsk, which was the administrative and economical centre of the Siberian Governorate (‘guberniya’). After returning to Sweden, some of the Swedish officers published their research and other collected data about the history, geography, ethnography, archaeology, and languages of Siberia. In 1730, the Swedish officer Philipp Johan Tabbert von Strahlenberg published a map of Russia and the Tatar areas together with a history and geography book of northeastern Eurasia. Learning from Russian discoveries of northeastern Asia he made new knowledge about Eurasia available to western countries. Strahlenberg, who was born Philipp Johan Tabbert in 1676, was a captain of the Swedish Army. In 1707 he was given the surname von Strahlenberg and ennobled by King Charles XII for bravery shown at the Battle of Fraustadt against the Saxon-Polish army. During his years of captivity in Tobolsk, Strahlenberg was working on a map of Siberia. He was collecting geographic, historic and ethnographic materials about Siberia. Travelers on their way to Central Asia or China often passed by Tobolsk, giving Strahlenberg the opportunity to make their acquaintance and acquire further knowledge. One such acquaintance was Daniel Gottliev Messerschmidt (1685–1735), who was sent to Siberia by Peter the Great. Messerschmidt managed to include Strahlenberg in his expedition to Siberia in 1721. The expedition spent several months in the town of Tomsk before continuing to Narym, Jenisej, Abakan, and Krasnoyarsk. The Nordic War came to an end, and in 1723 Strahlenberg could return to Sweden. After his return he continued on his project to create a map of Russia and the Tatar areas with a historic and geographical account. In 1730 his map titled “Nova Descriptio geographica Tatariae Magnae…” and his work called “Das Nord- und östliche Theil von Europa und Asia” were published. According to Novljanskaja, the author of the present volume, Strahlenberg’s map is special because it is the product of his effort to use both new results developed by western European cartography as well as the geographical and cartographical materials that he collected during his stay in Russia. 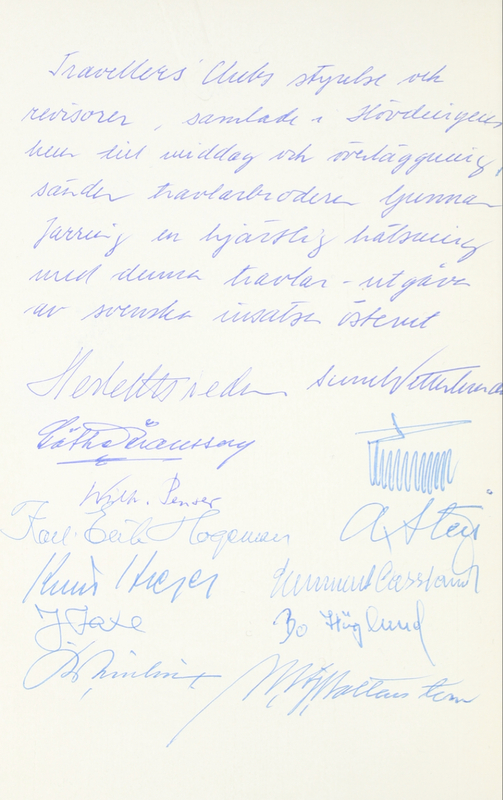 In this copy from the private library of Ambassador Gunnar Jarring, you find on the back side of the front cover a handwritten note in Swedish signed by several members of the Travellers Club, where Gunnar Jarring was a member. According to the note the present volume was sent as a gift to Jarring from friends at this club.